A Hungry Great White Shark... Frightening. 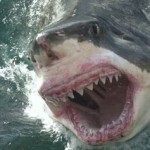 There’s been an unprecedented rash of shark attacks in Australia lately, and intense levels of shark activity rocked the California and Florida coasts in 2008. Should you be afraid of the man in the grey suit? Of course you should. There’s a distinct possibility that climate change is affecting the number of fatal shark attacks. Soon the sharks will take to the streets and hunt us in our beds as we sleep. You have nothing to fear except for The Fear Beneath!